The Food Alphabet and More: #IAMVIKINGS Video Contest - Nikon cameras and Vikings GCs up for grabs! 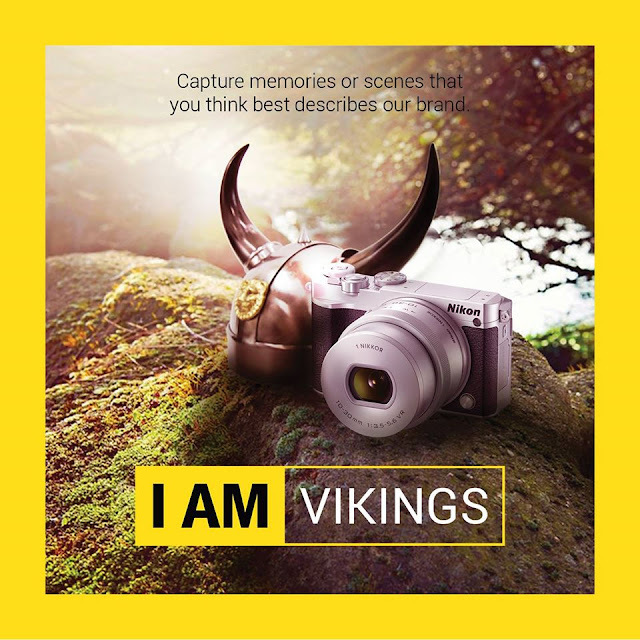 #IAMVIKINGS Video Contest - Nikon cameras and Vikings GCs up for grabs! To all the creative Vikings out there, it's time to show your creativity! Join the "I AM Vikings" video contest, in collaboration with Nikon, and get a chance to win a brand new Nikon 1 J5 Kit and P10,000 worth of Gift Certificates! 1) Contestants should produce a video that relates to the campaign “I AM Vikings”: Storytellers need to show memories or scenes that they think best describe our brand (Vikings). 2) The length of video can only be a maximum of 30 seconds and must include the Vikings logo and tagline (The Philippines’ Largest Buffet Restaurant) at the end of the video. 4) Contestants must post their entry using their Facebook and YouTube account with the caption/title "I AM VIKINGS". Profiles must be set up on public so that judges may view your entry. 5) Tag us on Facebook and 5 of your friends; they must also like Vikings’ Facebook page and Nikon Philippines’ Facebook page. 7) Judges will choose the top 5 videos from the entries; the 5 competing entries will be posted on Vikings’ official Facebook page and Youtube Account for voting. 8) Only one entry is allowed per person. 1st prize: (1) Nikon 1 J5 kit with 10-30mm and P10,000 worth of Gift Certificates from Vikings and NIU (P5,000 Vikings and P5,000 NIU). 2nd prize: (1) Nikon Coolpix S33 and P5,000 worth of Gift Certificates from Vikings. 3rd Prize: (1) Limited edition Nikon luggage and P3,000 worth of Gift Certificates from Four Seasons Hotpot City. 10) Contest will run from December 1, 2015 to December 31, 2015. Entries must be submitted on or before December 31, 2015 (6 pm). 11) Announcement of winners will be on January 8, 2015 (6 pm) and will be announced on Vikings’ Facebook page. Winners will also be notified thru private message. - By entering the "I am Vikings" video contest, contestant understands and agrees that the winning video will become an exclusive property of Vikings Luxury Buffet and ThinkDharma Inc., which retains exclusive rights to the reproduction of the video. - Contestant must acknowledge that the submitted video is (a) original, (b) does not violate any copyright, publicity right, and privacy right. Vikings Luxury Buffet and ThinkDharma Inc.has the right to edit and alter the video for promotional purposes. - All entries will be subject for screening, to those that comply with the given rules and guidelines (posted in our website and social media sites) will be entered in the competition. - Top 5 videos will be posted in our Facebook and YouTube pages for voting. The video with the highest number of “likes” and “views” will get the 10 points. - Winner will be notified by email and announced on our Facebook pages.